Alienware Alpha, the “Steam-Machine-That-Totally-Isn’t-A-Steam-Machine-Because-It-Runs-Windows,” is now available for preorder, the company announced Tuesday. The box retails for $550 and includes a wireless Xbox 360 controller. We got a first look at the Alpha’s UI last week in San Francisco, and the key word here is Console. The standard Alpha experience is all governed with a controller, using Alienware’s custom Alpha UI. It looks a lot like Sony’s XMB, used on the PlayStation 3 and PlayStation 4. There’s lots of horizontal scrolling, and a host of submenus. In other words, it’s not at all the type of interface you’d want to use with a mouse, but it’s perfect for a couch-friendly controller environment. Alienware has folded all the things you typically must do when setting up a new computer into this controller-friendly interface: Entering a password to join a wireless network, setting the display resolution, configuring audio settings, and more. You can even adjust the overscan so UI elements don’t disappear beyond the edges of your TV’s screen—something that’s not easy to do when running a standard Windows machine on a TV. You can still mess with some basic settings after the initial set-up, and shut down the machine with just a controller paired. The Alpha keeps Windows and graphics drivers updated automatically, though you can of course adjust those settings. It’s all very console-like, down to the somewhat cumbersome use of a virtual keyboard. Right now the main Console Mode page is limited to Settings, Power options, and Steam, though Alienware isn’t ruling out further shortcut apps later—say, a dedicated Netflix button. On the other hand, I’m told that Alpha is first and foremost for games, not media consumption; besides, you could always navigate to Desktop Mode and open Netflix that way. It’s just not as convenient. You can also plug in a real mouse and keyboard at any time and run the Alpha as a standard desktop. You could even throw out your normal PC rig and just run an Alpha as a mid-tier machine. Plugging in a mouse enables you to access desktop mode and switch back and forth between that and console mode. “A lot of other competitors out there, they’re like ‘Oh we just take you right into Steam Big Picture.’ That’s just one part of the challenge of taking PC gaming into the living room,” says Diana. Alpha is a full user experience, divorced from any of the hassles of Windows itself. You should never see a desktop. You should never see a stock Windows notification. It’s ambitious and crazy and might go horribly wrong. I have no way of knowing how the end product will fare—Alienware is even being cagey about what sort of graphics performance we can compare the Alpha to, though they did show me the system running Dark Souls II with maxed-out settings at more than 60 frames per second. It’s definitely no slouch, especially for $550. 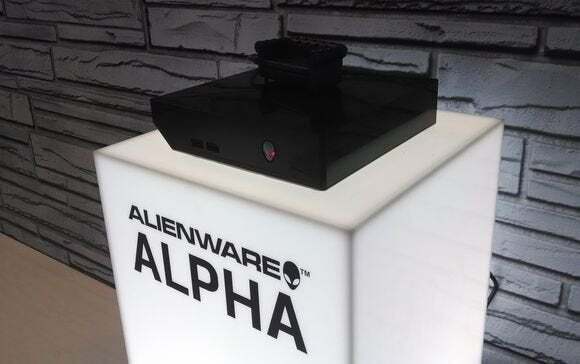 We’ll have a review as soon as we get our hands on a system; but for now, the Alpha looks like it might be the box to finally bring PC gaming into mainstream living rooms. If you decide you want SteamOS down the road—if and when it ever becomes available—Alienware will let you switch. But that’ll be a one-way trip: You won’t be able to dual boot and you won’t be able to go back.